More than a year ago, when we had bought the boat but hadn’t moved aboard yet I found this print while reading Kind Over Matter. It says, “it is in all of us to defy expectations to go into the world and to be brave; and to want, to need, to hunger for adventures; to embrace change and chance and risk so that we may breathe and know what it is to be free.” I knew with certainty that we were on the right life path—about to live on our boat while we got ready to travel the world—but I took her message as a huge encouragement. Her prints and her original works are listed on her etsy store and I’ve gone back many times to look and wished that I had a wall for a print. Last week I decided to order an 8×10 print even if I was only going to tape it up on the hanging locker door. When I got my package I found that she had surprised me with another print quoting Tennessee Williams, “Make Voyages attempt them! There is nothing else.” Thank you so much Mae for sending me a little extra! I love them both and bought frames and Velcroed them up. It’s fun to have art again. Mae Chevrette is a young artist in Boston who is clearly influenced by the sea. I love art with words (even my wedding ring has words on it), love the colors she uses, and love the power of the sea. She’s someone I’m definitely watching! Maybe someday, long from now, after I’ve travelled the world and live by the sea, I’ll have a wall instead of a bulkhead and I’ll know this Emerson quote is true, “ Though we travel the world all over to find the beautiful we must carry it with us or we’ll find it not,” and I’ll be looking for the original to remind me of my adventures. Maybe someone I know could buy it and save it for me? Filed under aesthetics, Living Aboard. Tagged adventure, art, art with words, encouragement, inspiration, Kind Over Matter, Mae Chevrette, print, quotations, sea, To Go Into The World, voyages. Fabulous prints! 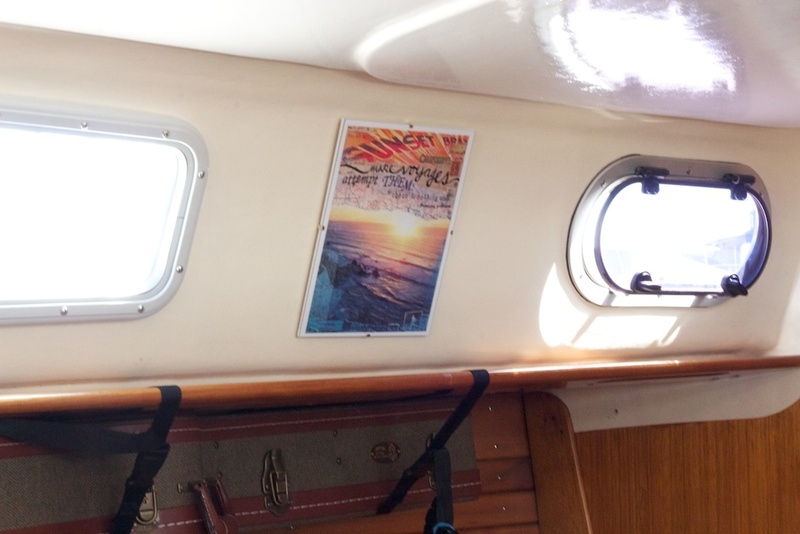 And yes you can have art in your boat. Velcro is awesome and if you have an ikea near you we found these frames that ROCK because (1) they are flush (2) no glass (3) colorful! We have them everywhere! We’re so close to IKEA we can use it as an aid to navigation in the dark! I bought glass clip frames for under $5 at Blick but certainly plastic would be safer.